"Submillimeter telescope" redirects here. For the telescope formally known as the Submillimeter Telescope, see Heinrich Hertz Submillimeter Telescope. Panoramic view of the Chajnantor plateau, spanning about 180 degrees from north (on the left) to south (on the right) shows the antennas of the Atacama Large Millimeter Array. The most significant limitation to the detection of astronomical emission at submillimetre wavelengths with ground-based observatories is atmospheric emission, noise and attenuation. Like the infrared, the submillimetre atmosphere is dominated by numerous water vapour absorption bands and it is only through "windows" between these bands that observations are possible. The ideal submillimetre observing site is dry, cool, has stable weather conditions and is away from urban population centres. There are only a handful of such sites identified, they include Mauna Kea (Hawaii, United States), the Llano de Chajnantor Observatory on the Atacama Plateau (Chile), the South Pole, and Hanle in India (the Himalayan site of the Indian Astronomical Observatory). Comparisons show that all four sites are excellent for submillimetre astronomy, and of these sites Mauna Kea is the most established and arguably the most accessible. There has been some recent interest in high-altitude Arctic sites, particularly Summit Station in Greenland where the PWV (precipitable water vapor) measure is always better than at Mauna Kea (however Mauna Kea's equatorial latitude of 19 degrees means it can observe more of the southern skies than Greenland). The Llano de Chajnantor Observatory site hosts the Atacama Pathfinder Experiment (APEX), the largest submillimetre telescope operating in the southern hemisphere, and the world's largest ground based astronomy project, the Atacama Large Millimeter Array (ALMA), an interferometer for submillimetre wavelength observations made of 54 12-metre and 12 7-metre radio telescopes. The Submillimeter Array (SMA) is another interferometer, located at Mauna Kea, consisting of eight 6-metre diameter radio telescopes. 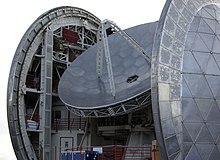 The largest existing submillimetre telescope, the James Clerk Maxwell Telescope, is also located on Mauna Kea. With high-altitude balloons and aircraft, one can get above even more of the atmosphere. The BLAST experiment and SOFIA are two examples, respectively, although SOFIA can also handle near infrared observations. Space-based observations at the submillimetre wavelengths remove the ground-based limitations of atmospheric absorption. The Submillimeter Wave Astronomy Satellite (SWAS) was launched into low Earth orbit on December 5, 1998 as one of NASA's Small Explorer Program (SMEX) missions. The mission of the spacecraft is to make targeted observations of giant molecular clouds and dark cloud cores. The focus of SWAS is five spectral lines: water (H2O), isotopic water (H218O), isotopic carbon monoxide (13CO), molecular oxygen (O2), and neutral carbon (C I). The SWAS satellite was repurposed in June, 2005 to provide support for the NASA Deep Impact mission. SWAS provided water production data on the comet until the end of August 2005. The European Space Agency launched a space-based mission known as the Herschel Space Observatory (formerly called Far Infrared and Sub-millimetre Telescope or FIRST) in 2009. Herschel deployed the largest mirror ever launched into space and studied radiation in the far infrared and submillimetre wavebands. Rather than an Earth orbit, Herschel entered into a Lissajous orbit around L2, the second Lagrangian point of the Earth-Sun system. L2 is located approximately 1.5 million km from Earth and the placement of Herschel there lessened the interference by infrared and visible radiation from the Earth and Sun. Herschel's mission focused primarily on the origins of galaxies and galactic formation. ^ "Recent Interest in Eureka on Ellesmere Island as a Submillimetre Observing Site" (PDF). Archived from the original (PDF) on 2015-07-03. ^ "ASIAA sub-mm VLBI Project" (PDF).